Faced with a competitive market structure and falling prices for biaxially oriented polypropylene (BOPP) films, Malaysia-based San Miguel Yamamura Plastic Films (SMYPF) has invested in a new CPP (cast polypropylene) film line from Austrian extrusion machine supplier SML. Said General Manager of SMYPF, Tang Han Lock, “We expect to increase our turnover by 50% as this line has an output capability of 5,000 tonnes/year. Currently, our plant is running at full capacity with our other lines (for BOPP and CPP) and we export 15% of our output.” He also said the firm has an average turnover of US$24 million a year. SMYPF is investing US$10 million in the new expansion, which includes the line and other equipment like metallisers and slitters. Sited in Malacca, around 120 km south of the capital city of Kuala Lumpur, SMYPF is part of San Miguel Yamamura Packaging International (SMYP), which is a joint venture between Philippines-based San Miguel Corporation (SMC), Southeast Asia's largest food and beverage and packaging company, and glass/PET bottle maker Nihon Yamamura Glass (NYG) of Japan. NYG took up a 35% equity stake in SMYP in 2009, to “diversify and expand its markets since the packaging market is shrinking in Japan and developing countries offer better opportunities”, according to Tang. The plant where SMYPF operates from has a history dating back to 1975 when it was set up by a few local individuals. It was subsequently taken over by locally based conglomerate Hong Leong Industries and sold to SMYP in 2005. The CPP line is the firm’s first machine installation in more than 20 years and its second CPP line. The first CPP line, from German supplier Reifenhäuser, has an output of 2,500 tonnes/year. “We will also upgrade this line and aim for a total output of 7,500 tonnes/year of CPP,” said Tang, adding that this will result in an almost 200% increase in CPP output for the firm. SMYPF also operates two BOPP lines, which were installed by Germany-based Brückner in the 1980s. “The lines have a width capability of between 4-4.5 m and a capacity of 8,000 tonnes/year,” explained Tang. Though the BOPP film sector has been one of the most successful of the packaging market, having grown from a specialist replacement for cellulose film to a market of around 6 million tonnes in 2011, it has been slowing down in the past few years. 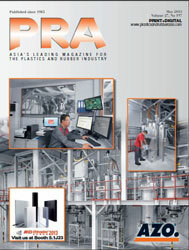 According to UK-based AMI Research’s study, the dynamics of the industry are changing. “In the developed markets of Europe, the US and Japan the markets are slowing down while producers rely on an ageing asset base to manufacture films,” says AMI. Of the total output produced by SMYPF, half is metallised using equipment from Germany-based Leybold. The firm will be adding on metallisers from UK supplier Bobst Group (with the new CPP line). “We are the only ones providing metallised film in Malaysia,” said Tang. Another reason for the purchase of the machine is because SMYPF is targeting the export markets, and it expects to increase its exports to 60% with the new CPP line. A target market is Japan and for this reason the firm is putting in a place a dust-free facility for the new line to meet the stringent requirements of the market. “We are unable to meet both the domestic and export demand with just one CPP line,” explains Tang, adding that even though there is an oversupply of CPP film, prices for CPP film are holding, unlike BOPP film. “The new line will fill the gap of an average 3,000 tonnes/year that is required by local converters who are currently importing from Indonesia and Vietnam,” he said. 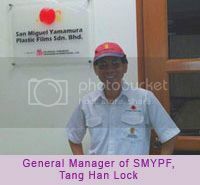 As for BOPP film, Tang says the local demand is stable. “We cater to a niche market of medium-size converters and are assured of local support for our BOPP film, even with the slowing global market,” he added. One such converter that SMYPF caters to is sister company San Miguel Yamamura Printing and Packaging that is located in Shah Alam, Selangor. The new facility to house the SML line is currently under construction, with the line to be delivered in October and full start up expected early next year.